A review of the history of the GLONASS program, its current status and an overview of the plans for the immediate future of the satellite constellation, its navigation signals and the ground support network. English versions of the GLONASS CDMA interface control documents are now available. See Further Reading. On Oct. 12, 1982, the Soviet Union launched the first GLONASS satellite. Whether in reaction to the development of GPS or simply to fulfill the requirement for a system with similar capabilities for its armed forces, the Soviet Union began the development of the Global’naya Navigatsionnaya Sputnikovaya Sistema or Global Navigation Satellite System in 1976 just three years after the start of the GPS program. The first test satellite, code-named Kosmos 1413, was accompanied by two dummy or ballast satellites with the same approximate mass since the Soviet Union was already planning to launch three GLONASS satellites at a time with its powerful rockets to save on launch costs. But because of launch failures and the characteristically brief lives of the satellites, a further 70 satellites were launched before a fully populated constellation of 24 functioning satellites (providing full operational capability or FOC) was achieved in early 1996. Unfortunately, the full constellation was short-lived. Russia’s economic difficulties following the dismantling of the Soviet Union hurt GLONASS. Funds were not available, and by 2002 the constellation had dropped to as few as seven satellites, with only six available during maintenance operations! But Russia’s fortunes turned around, and with support from the Russian hierarchy, GLONASS was reborn. Longer-lived satellites were launched, as many as six per year, and slowly but surely a full constellation of 24 satellites returned. And on Dec. 8, 2011, FOC was again achieved and has been subsequently more or less maintained — the system has even operated sometimes with in-orbit spares. While GLONASS-only and survey-grade dual-system GPS/GLONASS receivers have been around for more than a decade, manufacturers took notice of GLONASS’s rebirth and began producing chips and receivers with GLONASS capability for the consumer market. In 2011, Garmin released handheld receivers supporting both GPS and GLONASS. In the same year, various cell-phone manufacturers started offering GLONASS capability with their embedded positioning modules. The early GPS/GLONASS receivers paved the way for the multi-GNSS receivers we have today, with their capability to track not just GPS and GLONASS satellites but those of the European Galileo and Chinese BeiDou systems, as well as those of the Japanese Quasi-Zenith Satellite System (not to mention the satellites of the satellite-based augmentation systems). I documented the development of GLONASS in this column back in July 1997, and a team of authors from the Joint Stock Company Russian Space Systems discussed the plans for modernizing GLONASS in an April 2011 article. An update is overdue. So, in this article, I will briefly review the history of the GLONASS program, discuss its current status, and overview the plans for the immediate future of the satellite constellation, its navigation signals and the ground support network. During the Cold War, information about GLONASS was scarce. Apart from the general characteristics of the satellite orbits and the frequencies used for transmitting the navigation signals, the Ministry of Defence of the Soviet Union revealed little else. However, sleuthing by Professor Peter Daly and his students at the University of Leeds provided some details about the signals’ structure. With the advent of glasnost and perestroika, and the eventual demise of the Soviet Union, information about GLONASS became more readily available. Eventually, the Russians released the Interface Control Document (ICD). This document, similar in structure to the Navstar GPS Space Segment/Navigation User Interfaces ICD-GPS-200, describes the system, its components, and the structure of the signal and the navigation message intended for civil use. Its latest version was published in 2016, but so far this version is only publicly available in Russian. Satellites and Signals. Six models of GLONASS satellites (also known as Uragan, Russian for Hurricane) have been launched so far. Russia (actually the former Soviet Union) launched the first 10 satellites, called Block I, between October 1982 and May 1985. It sent up six Block IIa satellites between May 1985 and September 1986 and 12 Block IIb satellites between Apri1 1987 and May 1988, of which six were lost because of launch-vehicle-related failures. The fourth model was the Block IIv (v is the English transliteration of the Russian alphabet’s third letter). By the end of 2005, the Russians had deployed 60 Block IIvs. Each subsequent satellite generation contained equipment enhancements and also achieved longer lifetimes. A prototype GLONASS-M (for Modernized) satellite was launched on Dec. 1, 2001, along with two Block IIvs with the first two production GLONASS-M satellites included in the triplet launches of Dec. 10, 2003, and Dec. 26, 2004. Two GLONASS-M satellites were included in the triplet launch of Dec. 25, 2005. The new design offered many improvements, including better onboard electronics, a longer lifetime, an L2 civil signal, and an improved navigation message. Like earlier versions, the GLONASS-M spacecraft still used a pressurized, hermetically sealed cylinder for the electronics. FIGURE 1. Image from Reshetnev Information Satellite Systems, manufacturer of the GLONASS satellites, celebrating the 35th anniversary of the launch of the first GLONASS satellite in 1982 (“35 years of service to the world”). All GLONASS satellites launched since December 2005 have been GLONASS-M satellites with the exception of two GLONASS-K1 (sometimes referred to as just GLONASS-K) satellites, launched on Feb. 26, 2011, and Nov. 30, 2014. GLONASS-K1 satellites are markedly different from their predecessors. 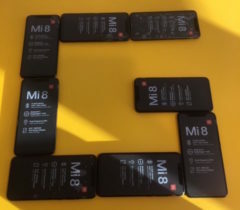 They are lighter, use an unpressurized housing (similar to that of GPS satellites), have improved clock stability and a longer, 10-year design life. They also include, for the first time, code-division-multiple-access (CDMA) signals on a third frequency accompanying the legacy frequency-division-multiple-access signals (I’ll discuss these shortly). All of the GLONASS satellites have been manufactured by the Joint Stock Company Reshetnev Information Satellite Systems, located in Zheleznogorsk near Krasnoyarsk in central Siberia, and named after Mikhail Fyodorovich Reshetnev, the founding general director and chief designer. The Reshetnev company was formerly known as the Scientific Production Association of Applied Mechanics (Nauchno Proizvodstvennoe Ob”edinenie Prikladnoi Mekaniki or NPO PM). The Roscosmos State Corporation for Space Activities (formerly the Federal Space Agency), commonly known as Roscosmos, is the governmental body responsible for GLONASS. FIGURE 1 includes artist’s images of the initial GLONASS, GLONASS-M and GLONASS-K1 satellites. GLONASS satellite orbits are arrayed in three planes, separated from one another in right ascension of ascending node by 120 degrees, with eight satellites in each plane. The satellites within a plane are equally spaced, separated in argument of latitude by 45 degrees. Satellites in adjoining planes are shifted in argument of latitude by 15 degrees. The satellites are placed into nominally circular orbits with a target inclination of 64.8 degrees and semimajor axis of approximately 25,510 kilometers, giving them an orbital period of about 675.8 minutes. These satellites have ground tracks that repeat every 17 orbits or eight sidereal days. The GLONASS orbit planes are numbered 1–3 and contain orbital slots 1–8, 9–16 and 17–24, respectively. FIGURE 2 shows the status of the constellation on Oct. 17, 2017. The orbital slot number (also called almanac slot) and frequency channel (discussed below) are given in parentheses. The recently launched GLONASS 752 was set healthy on Oct. 16, 2017, resulting in a fully operational 24-satellite constellation. All of the satellites are standard GLONASS-M satellites except for GLONASS 755, which includes a transmitter for the new third frequency, and GLONASS 701K and 702K. These last two are GLONASS-K1 satellites, with 702K operational while 701K is undergoing flight tests. The “K” isn’t part of the official GLONASS number but has been added to avoid ambiguity. A GLONASS-M satellite launched on Dec. 10, 2003, was also called GLONASS 701. Similarly, the International GNSS Service (IGS) refers to GLONASS 701K and 702K as 801 and 802, respectively. IGS also designates GLONASS 751 as GLONASS 851 to prevent confusion with Kosmos 2080, a GLONASS-IIv satellite launched on May 19, 1990, and also called GLONASS 751. And it designates GLONASS 753 as GLONASS 853 to prevent confusion with Kosmos 2140, a GLONASS-IIv satellite launched on April 14, 1991, and also called GLONASS 751. FIGURE 2. Status of GLONASS constellation on Oct. 17, 2017. A green square identifies the location of a healthy satellite and orange, a test satellite. Orbital slot numbers and frequency channels are given in parentheses. The satellites have been traditionally launched three at a time by Proton boosters from the Baikonur Cosmodrome near Leninsk in Kazakhstan. However, starting with the launch of the first GLONASS-K1 satellite, several GLONASS satellites have been launched singly on Soyuz rockets from the Plesetsk Cosmodrome north of Moscow. This arrangement provided 25 channels, so that each satellite in the full 24-satellite constellation could be assigned a unique frequency (with the remaining channel reserved for testing). Some of the GLONASS transmissions initially caused interference to radio astronomers, who study very weak natural radio emissions in the vicinity of the GLONASS frequencies. Radio astronomers use the frequency bands of 1610.6–1613.8 and 1660–1670 MHz to observe the spectral emissions from hydroxyl radical clouds in interstellar space, and the International Telecommunication Union (ITU) has afforded them primary user status for this spectrum space. Also, ITU has allocated the 1610–1626.5-MHz band to operators of low-Earth-orbiting mobile communications satellites. As a result, the GLONASS authorities decided to reduce the number of frequencies used by the satellites and shift the bands to slightly lower frequencies. The system now uses only 14 primary frequency channels with k values ranging from –7 to +6, including two channels for testing purposes (currently –5 and –6). (The +7 channel has also been used in the past for testing purposes.) How can 24 satellites get by with only 14 channels? The solution is for antipodal satellites — satellites in the same orbit plane separated by 180 degrees in argument of latitude — to share the same channel. This approach is quite feasible because a user at any location on Earth will never simultaneously receive the signals from such a pair of satellites. The move to the new frequency assignments started in September 1993. Like the legacy GPS signals, the GLONASS signals include two pseudorandom noise (PRN) ranging codes: ST (for Standartnaya Tochnost or Standard Precision) and VT (for Visokaya Tochnost or High Precision) similar to the GPS C/A- and P-codes, respectively (but at half the chipping rates), modulated onto the L1 and L2 carriers. As with GPS, GLONASS transmits the high-precision code on both L1 and L2. But, unlike the GPS satellites, the GLONASS standard-precision code has also been transmitted on the L2 frequencies beginning with the GLONASS-M satellites. (A separate civil code, L2C, has been added to the GPS L2 signal transmitted by Block IIR-M and subsequent satellites.) The GLONASS ST code is 511 chips long with a rate of 511 kilochips per second, giving a repetition interval of 1 millisecond. The VT-code is 33,554,432 chips long with a rate of 5.11 megachips per second. The code sequence is truncated to give a repetition interval of 1 second. Unlike GPS satellites, all GLONASS satellites transmit the same codes. They derive signal timing and frequencies from one of the onboard atomic frequency standards (AFSs) operating at 5 MHz. The various GLONASS satellite series since Block II through to the GLONASS-M series have three cesium AFSs on each satellite. The transmitted signals are right-hand circularly polarized, like GPS signals, and have comparable signal strengths. Navigation Message. Like GPS and the other GNSSs, the GLONASS signals also contain navigation messages providing satellite orbit, clock and other information. Separate 50-bits-per-second navigation messages are modulo-2 added to the ST- and VT-codes. The ST-code message includes satellite clock epoch and rate offsets from GLONASS System Time; the satellite ephemeris given in terms of the satellite position, velocity and acceleration vectors at a reference epoch; and additional information such as synchronization bits, data age, satellite health, offset of GLONASS System Time from Coordinated Universal Time (UTC) as maintained by the National Metrology Institute of the Russian Federation UTC(SU) as part of the State Time and Frequency Service, and almanacs (approximate ephemerides) of all other GLONASS satellites. Note that, unlike GPS System Time, for example, GLONASS System Time has no integer offset from UTC and so leap-second jumps are added to GLONASS System Time simultaneously with those added to UTC. Note, however, that GLONASS System Time is offset by a constant three hours to match Moscow Standard Time (MSK, an abbreviation for Moscow). The full message lasts 2.5 minutes, and is continuously repeated between ephemeris updates (nominally once every 30 minutes), but the ephemeris and clock information is repeated every 30 seconds. The GLONASS authorities have not published, at least publicly, details of the VT-code navigation message. It is known, however, that the full message takes 12 minutes and that the ephemeris and clock information are repeated every 10 seconds. Geodetic System. GLONASS ephemerides are referenced to the Parametry Zemli 1990 (PZ-90 or, in English translation, Parameters of the Earth 1990, PE-90) geodetic system. PZ-90 replaced the Soviet Geodetic System 1985, SGS 85, used by GLONASS until 1993. PZ-90 is a terrestrial reference system with its coordinate frame defined in the same way as that of the International Terrestrial Reference Frame (ITRF). The initial realization of PZ-90 had an accuracy of one or two meters. However, in an effort to bring the system closer to the ITRF (and GPS’s WGS 84 geodetic reference system), two updates to PZ-90 were carried out. The first update, resulting in PZ-90.02 (referring to 2002), was adopted for GLONASS operations on Sept. 20, 2007, and brought the frame of the broadcast orbits (and hence derived receiver coordinates) closer to ITRF and WGS 84. Another realization, PZ-90.11, adopted on Dec. 31, 2013, reportedly reduced the differences to the sub-centimeter level. TABLE 1 lists the defining constants and parameters of PZ-90. TABLE 1. Fundamental geodetic constants and some of the parameters of the PZ-90 geodetic system as used by GLONASS. The new GLONASS-K satellites transmit additional signals. GLONASS-K1 transmit a CDMA signal on a new L3 frequency (1202.025 MHz), and GLONASS-K2, in addition, will feature CDMA signals on the L1 and L2 frequencies. FIGURE 3. Circular reflector array on a GLONASS-K1 satellite, surrounding navigation signal inner antenna elements. 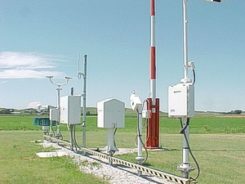 Photo from Reshetnev Information Satellite Systems. Control Segment. Similar to GPS and other GNSSs, GLONASS requires a network of ground stations for monitoring and maintaining the satellite constellation and for determining the orbits of the satellites and behavior of their operating AFSs. The tracking network uses stations only within the territory of the former Soviet Union, supplemented with satellite laser ranging stations to help with orbit determination since all GLONASS satellites contain laser reflectors (see FIGURE 3). Having a non-global network of tracking stations for determining the satellite orbits and AFS behavior results in slightly degraded GLONASS signal-in-space range error (SISRE). Recently, a number of tracking stations overseas have been established in conjunction with the development of the Russian satellite-based augmentation system (SBAS), the System for Differential Correction and Monitoring (SDCM). SDCM will function in a similar fashion to the Wide Area Augmentation System or WAAS, the U.S. SBAS, and the other SBASs in operation. The addition to the tracking network of the overseas SDCM stations, which already includes stations in Antarctica and South America with more stations coming, could help improve SISRE. Roscosmos also uses a global network of IGS and other tracking stations to monitor the health of the GLONASS constellation (see FIGURE 4). FIGURE 4. Roscosmos global GLONASS satellite health monitoring network with 22 reporting stations on Oct. 18, 2017, between 13:00 and 14:00 MSK. Performance. SISRE has improved over the years and is currently at the level of about 1 to 2 meters. In part, this is due to the better performance of the on-board AFSs carried by the latest GLONASS-M satellites compared to the first GLONASS-M satellites. Their relative one-day stability has improved from 10-13 to 2.4 × 10-14. FIGURE 5 shows a time series of recent values of SISRE determined by the Information and Analysis Center for Positioning, Navigation and Timing. These error levels can result in pseudorange-based positioning errors using GLONASS broadcast orbits and clocks about a factor of two worse than those provided by GPS — although, at any given instant, positioning accuracy will also be impacted by atmospheric effects and multipath and these could dominate the signal-in-space errors. FIGURE 5. GLONASS daily root-mean-square signal-in-space range error in meters as determined by the Information and Analysis Center for Positioning, Navigation and Timing. Much higher positioning accuracies can be obtained using GLONASS orbits and clocks provided by the IGS and its participating analysis centers. This is particularly true if carrier-phase measurements are used instead of or as a supplement to pseudorange measurements. A combination of appropriately weighted GPS and GLONASS measurements has shown to be beneficial in terms of availability, accuracy and efficiency, especially for high-accuracy positioning carried out using the real-time kinematic or RTK approach. Furthermore, the precise point positioning (PPP) technique, based on real-time or post-processing of dual-frequency carrier-phase measurements with precise satellite ephemeris and clock data, has demonstrated that kinematic decimeter-level accuracy is possible using GLONASS data or GLONASS data in combination with GPS data. GLONASS-only static PPP solutions over 24 hours have achieved accuracies at the millimeter level. Users. The initial uptake of GLONASS by both civil and military users in the former Soviet Union and subsequently in Russia, not to mention outside Russia, was minimal. Prototype GLONASS-only receivers were developed for the military, and foreign GPS/GLONASS receivers were developed by several manufacturers for scientific and other advanced applications. The IGS added a set of GLONASS-tracking receivers to its network in 1998 and has continuously increased the number of such receivers since then. However, consumer use of GLONASS both within and outside Russia has only recently taken off with the development of GLONASS-only and combined GPS/GLONASS chipsets. Such chipsets are now featured in many mobile phones and in handheld GNSS receiver and vehicle navigation units. As previously mentioned, the GLONASS-K1 satellites include a CDMA signal accompanying the legacy FDMA signals on a new L3 frequency of 1202.025 MHz. The ranging-code chipping rate for the CDMA signal is 10.23 megachips per second with a period of 1 milliseconds. It is modulated onto the carrier using quadrature phase-shift keying (QPSK), with an in-phase data channel and a quadrature pilot channel. The set of possible ranging codes consists of 31 truncated Kasami sequences. (Kasami sequences, introduced by Tadao Kasami, a noted Japanese information theorist, are binary sequences of length 2m – 1 where m is an even integer. These sequences have good cross-correlation values approaching a theoretical lower bound. The Gold codes used in GPS are a special case of Kasami codes.) The full length of these sequences is 214 – 1 = 16,383 symbols, but the ranging code is truncated to a length of N = 10,230 with a period of 1 milliseconds. The associated navigation message symbols are transmitted at a rate of 100 bits per second with half-rate convolution coding. The so-called navigation message superframe (2 minutes long) will consist of 8 navigation frames (NFs) for 24 regular satellites in the GLONASS first modernization stage and 10 NFs (lasting 2.5 minutes) for 30 satellites in the future. Each NF (15 seconds long) includes 5 strings (3 seconds each). Every NF has a full set of ephemerides for the current satellite and part of the system almanac for three satellites. The full system almanac is broadcast in one superframe. The lighter, unpressurized K1 satellites feature two cesium and two rubidium AFSs. The relative daily stability of one of the rubidium AFSs on a K1 satellite is reported to be 4 ×10-14. As a result, the SISRE for this satellite is about 1 meter. Plans call for adding a CDMA signal to L2 on future versions of the K1 satellites, dubbed K1+ (see below). GLONASS-K2 Satellites. These satellites will be heavier than the K1 and K1+ satellites with greater capabilities including a CDMA signal at the GPS/Galileo L1/E1 frequency. Reshetnev ISS will initially build two K2 satellites before going into mass production. It had been planned to transition to the K2 satellites much sooner, only launching the two K1 satellites now in orbit. But apparently plans changed because of the sanctions restricting the delivery of radiation-resistant electronic components from the West. Now, Reshetnev ISS will build an additional nine GLONASS-K1 satellites. It’s not clear how many of these might be of the K1+ variety. The GLONASS-K1 satellites will now be transition satellites between the existing GLONASS-M satellites (including the half-dozen or so that have been manufactured and stored on the ground for future launch as needed) and the future GLONASS-K2 satellites. One of the first K2 satellites will host a passive hydrogen maser (PHM) AFS. The PHM has been under development for about a decade, and multiyear ground tests displayed a reliability and one-day stability of 5 × 10-15. It is expected to contribute to future 0.3-meter SISRE. According to a recent report, GLONASS-K2 satellites will begin flight tests in 2018, with mass production of GLONASS-K2 satellites to begin in the 2019–2020 time frame. Improved Tracking Networks. The development of the SDCM and its associated tracking network has already been mentioned. The SDCM network stations are equipped with combined GPS/GLONASS dual-frequency receivers, hydrogen maser atomic clocks and direct communication links for real-time data transfer. As mentioned earlier, GLONASS authorities are looking at whether additionally using the SDCM stations for GLONASS orbit and clock determination would significantly enhance the accuracy of the broadcast data. GPS, the oldest GNSS, is continuing to modernize and will soon launch the first Block III or GPS III satellite. Already, GPS Block IIR-M and Block IIF satellites are transmitting new signals. Galileo is fielding modern satellites right from the get go, and BeiDou is about to start launching the operational version of its BeiDou-3 satellites. GLONASS is not to be outdone. It has provided useful positioning, navigation and timing services since at least 1996. While at times the service level has dropped below acceptable levels, it is now a dependable system and, with announced improvements, will be a contender in the future world of multi-GNSS. “GLONASS Programme Update” by I. Revnivykh presented at the 11th Meeting of the International Committee on Global Navigation Satellite Systems, Sochi, Russia, Nov. 6–11, 2016. “GLONASS” by S. Revnivykh, A. Bolkunov, A. Serdyukov and O. Montenbruck, Chapter 8 in Springer Handbook of Global Navigation Satellite Systems, edited by P.J.G. Teunissen and O. Montenbruck, published by Springer International Publishing AG, Cham, Switzerland, 2017. GLONASS Interface Control Document, Navigational Radiosignal in Bands L1, L2, Edition 5.1, Russian Institute of Space Device Engineering, Moscow, 2008. GLONASS Interface Control Document, General Description of Code Division Multiple Access Signal System, Edition 1.0, JSC Russian Space Systems, Moscow, 2016. GLONASS Interface Control Document, Code Division Multiple Access Open Service Navigation Signal in L1 Frequency Band, Edition 1.0, JSC Russian Space Systems, Moscow, 2016. GLONASS Interface Control Document, Code Division Multiple Access Open Service Navigation Signal in L2 Frequency Band, Edition 1.0, JSC Russian Space Systems, Moscow, 2016. GLONASS Interface Control Document, Code Division Multiple Access Open Service Navigation Signal in L3 Frequency Band, Edition 1.0, JSC Russian Space Systems, Moscow, 2016. System of Differential Correction and Monitoring Interface Control Document, Radiosignals and Digital Data Structure of GLONASS Wide Area Augmentation System, System of Differential Correction and Monitoring, Edition 1, JSC Russian Space Systems, Moscow, 2012. “GLONASS: Developing Strategies for the Future” by Y. Urlichich, V. Subbotin, G. Stupak, V. Dvorkin, A. Povalyaev and S. Karutin in GPS World, Vol. 22, No. 4, April 2011, pp. 42–49. “GPS, GLONASS, and More: Multiple Constellation Processing in the International GNSS Service” by T. Springer and R. Dach in GPS World, Vol. 21, No. 6, June 2010, pp. 48–58. 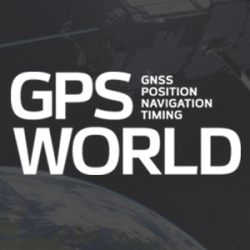 “The Future is Now: GPS + GLONASS + SBAS= GNSS” by L. Wanninger in GPS World, Vol. 19, No. 7, July 2008, pp. 42–48. “GLONASS Spacecraft” by N.L. Johnson in GPS World, Vol. 5, No 11, Nov. 1994, pp. 51–58.